If you have ever lined 200 envelopes, you know it’s a tough and boring job. But, an envelope that looks pretty inside and outside makes everything more fun. 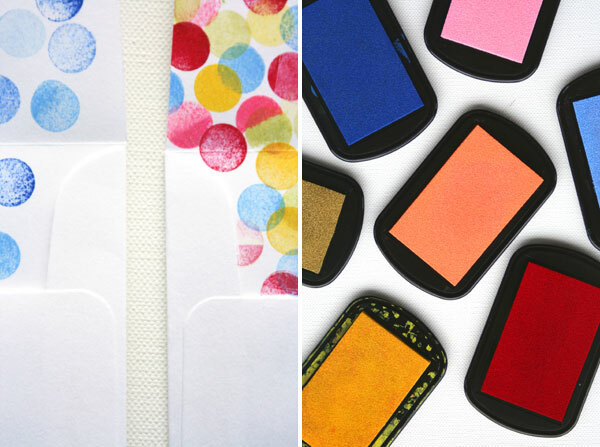 Stamping the insides of your envelopes is super quick and you can make them all look a little different. And, if you are not sending it through the mail, you should stamp up the outside too! Materials needed: stamp pads, envelopes, tape and a stamp. Step 2: start stamping the first color – don’t think too much of where you place it, the more color you add, the more it will come together. 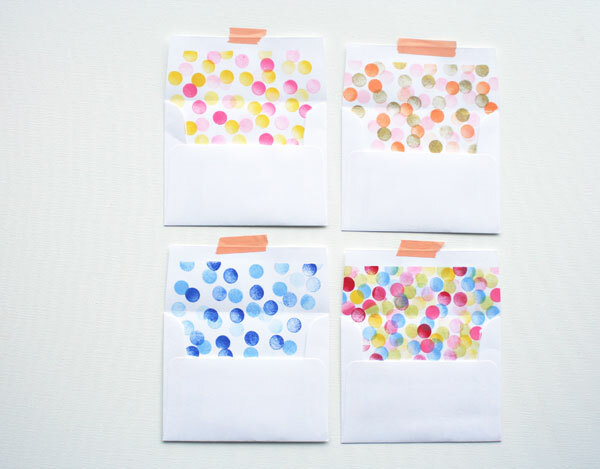 If you happen to have a white stamp pad, I’m sure a black envelope with white dots will look stunning! Such a cute idea. I love liner – I DIY-ed for me wedding invites – made the invite, in my opinion! I will need to try this out! I am TOTALLY going to do this and write some spring happy letters to people! Happy Happy Happy! This is a really cute idea, and it seems so simple but with a really nice effect. One quick question – what kind of tape did you use to tape off the un-stamped areas? I just worry about ripping the envelope when pulling the tape off. Wouldn’t it be easier/quicker to cut out a cardboard template with a “stamp here” window—then you could just pop it on top of each envelope, stamp away, and then lift it up with no taping or un-taping? The tape things would be fine for a few envelopes, but ‘d imagine it’d get old after 200 envelopes. Cute! May just have to do this for our wedding invites. Thanks for the DIY! You are so good! I was seriously trying to think of something new and different to dot stamp and couldn’t figure it out. This is awesome! Love these! Another great DIY idea. omg, you’re a genius! this is soooo cute! my little boy will turn one in May and I’ll surely do this for his invitations’ envelopes! I love this idea. I am a sucker for printed envelopes and even pick my stamps based on the letters I am sending so these are so up my alley. Thanks for sharing. Wow, what a great idea. I would never have thought of doing this. A great one top remember for a traint day with the kids. I read this in my Google reader and thought “Wouldn’t it be easier to use a cardboard template?” and then came over here and Jack had already thought of it! 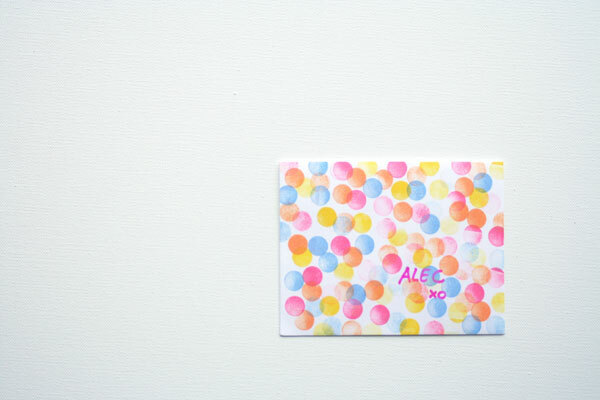 I’ve used cardboard templates for stamping a single big square full of dots on invitations before – it worked well. I love this idea to bits! Interesting idea and easy to do. I am going to try with my little daughter. So easy and fun! I featured your DIY on my polka dot DIY trend blog post today.